A little rain or snow will not harm your fur. Hang your fur to dry in a cool place with circulating air—never inside a closet. If your fur is soaked through, it requires prompt attention and treatment by a reliable furrier. Use broad-shouldered hangers when hanging your fur. Allow space around it to prevent it from being crushed. Never comb or brush your fur. Occasionally shake your fur gently to keep it clean and restore its natural fullness. Do not carry heavy packages, handbags, or shoulder bags where they will rub your fur and cause wear spots. Do not pin items to your fur. Never spray perfume on your fur. Alcohol dries leather and stiffens fur. Never mothproof your fur with insecticides or sprays. To avoid damage to your fur during hot weather, store in a reliable furrier’s cold storage vault. Do not use dry cleaning fluid on your fur. 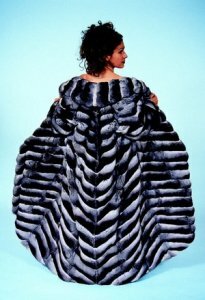 Have your furs professionally cleaned regularly, once per season at minimum, by a fur specialist. This regular care will remove dirt, bring back the luster, and prolong the life of your fur. To prevent rips and undue wear, unfasten your coat to allow “give” as you sit down. In case of small rips or tears, have repairs done immediately. Never store your fur in a plastic bag where air cannot circulate because it causes leather to dry out. Please do not hesitate to contact us with any questions or to learn more information about caring for fur.